Zurreal's Folly is a Tactical weapon. Capturing Zurreal the Eternal requires this weapon and a Scholar Charm. This trap is the only devised tool suspected of being able to capture Zurreal the Eternal. 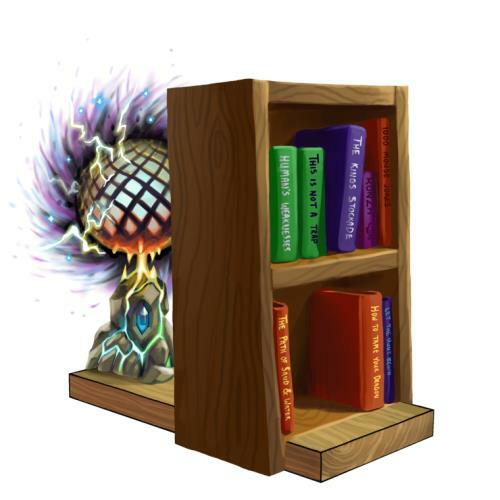 A harmless looking bookshelf features literature designed to intrigue Zurreal, distracting him from the trap hidden behind the shelf. The traps's design is complex, but it's utility is simple: Drain all magical and electrical energy in the immediate area. The trap is powered by undead ectoplasm to remain active while using augmented metal netting and runic rocks to open a small hole to another dimension and vacuum all other energy far away. This trap should be enough to knock Zurreal's walking throne out of commission, leaving him mostly helpless. WARNING: Do not try to operate Droids, heavy machinery or magics anywhere near this trap while activated! Zurreal's Folly is not sold by any Trapsmith. It can only be crafted by starting the Zurreal Trap Research assignment in the Crystal Library, then hunting in various places to obtain the proper ingredients from the first nine steps. Crafting the trap makes up the tenth step to actually complete the research assignment. Smashing a partially completed assignment does not lose any of the crafting ingredients already obtained, and starting another Zurreal Trap Research assignment will resume from that same partially-completed state. Note that no other Tactical weapons can be used to capture Zurreal the Eternal, but Zurreal's Folly can be used in areas outside the Crystal Library. Scholar Charm - Required for catching Zurreal the Eternal. Uncharged Scholar Charm - Capturing a Chess Master with the Uncharged Scholar Charm armed results in a Scholar Charm. 25 August 2011: The first Zurreal's Folly was crafted. The trap artwork includes references to the King's Stockade and Ronza, as well as a reference to the movie How to Train Your Dragon, and the MouseHunt fan fiction and web comic Let the Hunt Begin. This page was last edited on 13 January 2019, at 15:54.